Editors: Mayer, Richard E. and Alexander, Patricia A. During the past twenty years researchers have made exciting progress in the science of learning (i.e., how people learn) and the science of instruction (i.e., how to help people learn). 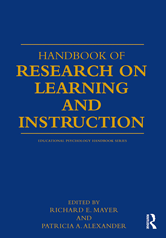 This Handbook examines learning and instruction in a variety of classroom and non-classroom environments and with a variety of learners, both K-16 students and adult learners. The chapters are written by leading researchers from around the world, all of whom are highly regarded experts on their particular topics.